6 weeks - new crawlers- Come bend, breathe and bond with your baby, while getting back in shape in this fun and playful yoga class. Moms will experience a class of flowing asanas, gentle poses, and restorative postures all designed to help strengthen core muscles and realign the body, with particular focus on post pregnancy hot spots such as the neck, shoulders and back. And we won't forget about baby yogi! We have lots of really useful yoga techniques that will help strengthen developing muscles, promote better sleep cycles and help with your infants digestion and fussiness. Dads and caregivers are welcome. All levels will enjoy this one of a kind yoga experience! Class is 1 hour. Please check our schedule for locations. Strong walkers - age 3 Parents partner with their toddlers in this imaginative and FUN class. 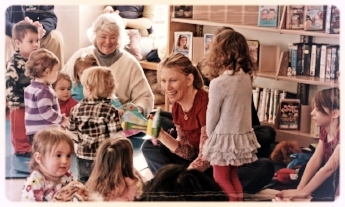 Creative movement, age appropriate yoga poses, songs, stories, props, and the OM Kids Puppet Family makes this class a huge hit with the three and under crowd. Parents will love it too, as they get in on the fun and stretching, and learn great tips and techniques to use at home. Caregivers are welcome. Class is 45 minutes. Please check our schedule for locations. Ages 3-4 Our preschool class for little yogis who are ready to practice yoga without their grown-up. Kids will build strength and grow their social skills by practicing age appropriate yoga poses, playing our cooperative games, and exploring the world, as we travel around on our fabulous yoga adventures, from fairy forests and big top circuses to Old MacDonald's farm and outer space. Class is 45 minutes. Please check our schedule for locations. Ages 4-6 Let's get bendy, go upside down and challenge our bodies in this exciting, energy releasing yoga class. Children will learn how to calm themselves down and relax with kid friendly breathing exercises and meditations, fun focus games, and our OMazing yoga adventures, which foster cooperation and creativity by giving kids the power of deciding where they will go and what they will see. Dragons at the zoo, hula dancing in Hawaii, royal balls with a favorite princess and swimming with sharks in Australia make practicing yoga a fun and very personal experience for this very special age group. Class is 45 minutes. Please check our schedule for locations. Ages 7-9 This super fun yoga class emphasizes mindfulness and self awareness through challenging yoga poses, creative games, kid friendly meditations and music. Kids will learn a variety of techniques to help them focus, relax and calm their minds, as well as build strength, increase flexibility and improve coordination. Classes are upbeat, engaging, and a great environment for making new friends and feeling really happy! Class is 1 hour. Please check our schedule for locations. Ages 10-15 Both inner and outer strength are the main focus of our tween and teen yoga classes. Kids will practice flowing sequences, restorative yoga postures and deep relaxation as they begin to build the foundations for a lifetime of physical well being and emotional balance. Classes are playful, fun and really calming. This age group needs yoga the most! Yoga helps give kids the tools they need to navigate through what can be a very challenging and confusing time in their lives. Fantastic for any tween or teen, but especially helpful for stressed out and anxiety ridden kids. All levels. Class is 1 hour. Please check our schedule for locations. This 40 minute, drop in only class, is an OM Kids favorite. Books come alive with puppets, songs and yoga poses. Stories are carefully chosen that naturally lend themselves to yoga. You’ve never seen a story time like this one! $10 per child, $5 for siblings, parents and non walking babies are free and are welcome to join in on the fun! Please check our schedule for locations.